My silly little trend line that I slapped on my PSA tracking chart wasn’t so silly after all. It was dead on target. My latest PSA: 0.09 ng/ml. Even though I expected this (thanks, trend line), I’m still absorbing the significance of yet another increase in my PSA. In a way, I’m glad to see the results that I have. Certainly not because I want the cancer to come back, but because it removes some of the doubt caused by the yo-yo readings last year. Now I can come to terms with the likelihood that I really am headed down the recurrence path, and I can focus on what’s ahead. So those are my thoughts in the first 30 minutes since seeing the results online. I’m sure there will be more thoughts to follow. I have to admit that I’m unusually unemotional about this at the moment. That’s good. I’m sure I’ll have more thoughts to share once this sinks in. Deep breaths! I guess you are two years away from hitting your red line. Good luck with whatever is next. Thanks, Tim. I was actually thinking in those same terms. It’s the silver lining in the cloud. Hi Eric. I won’t know for a while—my appointment with them isn’t until 12 September. Based on previous conversations with them, I suspect they’ll say that this is something to be more concerned about and that we’ll start looking at options when we get to the 0.15-0.18 ng/ml level. We’ll see. Sorry to hear your news Dan. My PSA is at a low level, just like yours but, also just like yours, mine looks like it’s going up and it’s that part my mind focuses on even though I know I should be focussing on the low level. The upside (if there can be one with this) is that there are still lots of treatment options. I must try to remember to tell myself that! Good luck!! Thanks, Jim. I understand exactly where you’re coming from. We get wrapped up in the trend versus the low PSA levels. 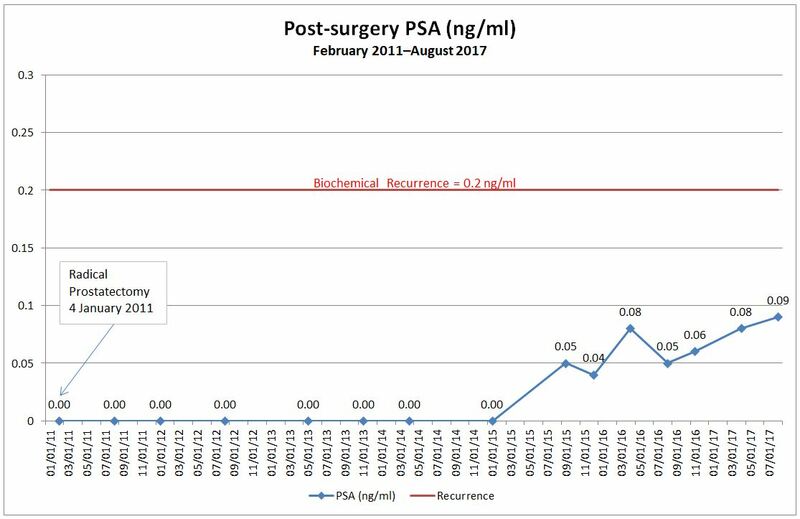 That said, however, the more recent research showing that it’s better to start salvage early at lower PSA levels (<0.1) does add an element of concern, too. Just pick what we're most comfortable with for ourselves, I guess. All the best! I too have read the research showing one should start salvage treatment early. In fact it seems they’re coming to the conclusion that they should hit it hard from the very beginning unless they’re convinced it’s a true wait and see cancer. Sorry you have to go thru this again. At least your PSA doubling time is long. Thanks, Jim. Yes, that’s a conversation that I’m going to have with my doctor when I see him. I agree about the doubling time.